MERCEDES-BENZ CERTIFIED PRE-OWNED WARRANTY! 2017 G 65 AMG in designo Platinum Magno over designo Black Nappa Leather with AMG Carbon Fiber Trim. Very clean inside and out, local 1-owner vehicle we sold new and took in on trade. Clean Carfax, no issues or stories. Hand built bi-turbo V12 producing 621 hp and 738 lb ft tq! 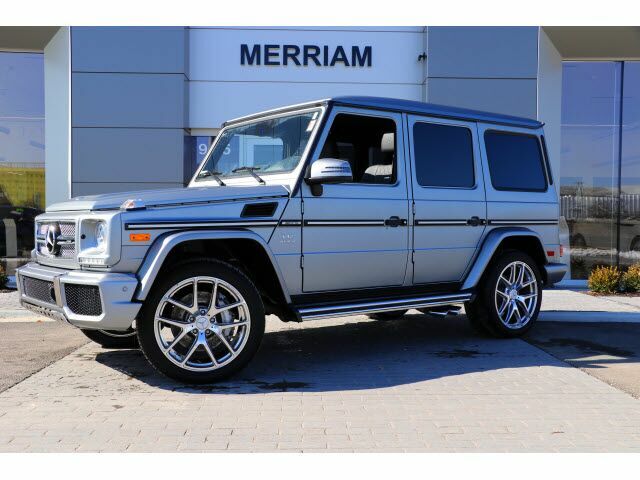 This vehicle comes loaded with standard features Navigation, Back Up Camera, Distance Pilot DISTRONIC, Parkign Assist PARKTRONIC, Heated Windshield, Comfort Package Seats, and this one has added optional AMG Silver Painted Brake Calipers, AMG Nappa/DINAMICA Performance Steering Wheel, All-Season Mats, Highly Polished 21 inch AMG Wheels, and the Grab Handles covered in black leather! Please Contact Brian Stacy 1-855-979-0255 to Test Drive Today! Aristocrat Motors, Kansas City's premier luxury dealer strives for the highest levels of customer service. Voted "Best in Business" by the readers of Ingram's magazine, our customers are our number one priority.